Tired of bad draws? Miss opportunities to use your amazing card reading skills online? No more. In Hands of Victory all players are dealt cards from their own decks. And since already played cards aren’t immediately shuffled back into their respective decks, card and deck information becomes valuable in real time. If you know how to use it. Here is a step-by-step explanation of how the Individual Deck Deal works. You start every game with a standard deck of 52 cards. And so do your opponents. There is also a separate board deck from which board cards are dealt. At the start of each hand you will be dealt three cards. Two you keep, one you discard. The discarded card goes back in the deck. This is called the Pineapple Draw. After the Pineapple Draw, each hand plays out like a normal Hold’em poker hand. The game keep track of all dealt cards and assures that no duplicates are ever in play. There are several abilities you can use to manipulate decks and cards and acquire information about them. When a hand is over, all hole cards are removed from play. The board cards however are put back into the board deck. All decks are then reshuffled and the next hand begins. As play progresses your deck will gradually shrink in size. 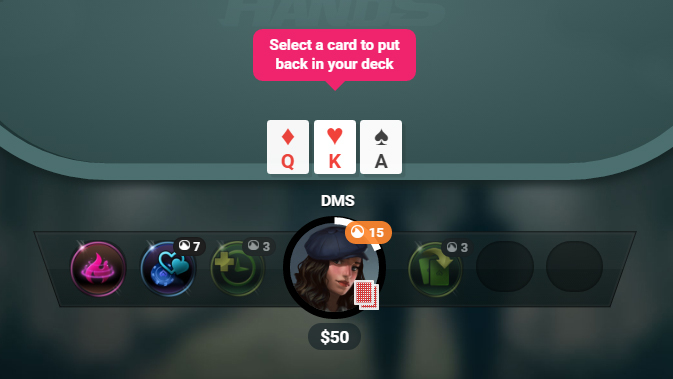 Through the deck icons in the table UI you can keep track of your and other players’ deck. Each bit of information you learn about their decks is automatically stored. Once any one player deck no longer has a unique card it can deal during the Pineapple Draw phase, play stops and all player decks are reassembled and reshuffled. Then the hand restarts with all players drawing from fresh decks.